Well folks, I'm finally emerging from my self imposed exile from the costuming world. I started grad school back in May 2014 and with that change came a whole host of other changes. Almost three years later, I have a new degree, a new job, and a new house! Needless to say, my costuming and event going has been on a three year hiatus. In the last three years, I've made very few costumes: a burlesque interpretation of the Winter Soldier, a regency dress, some Star Trek: TOS uniforms, and very little else. It's been three years of Greatest Hits costuming. Did I mention it's been THREE YEARS since I've made a historical costume I'm really proud of? Until now! 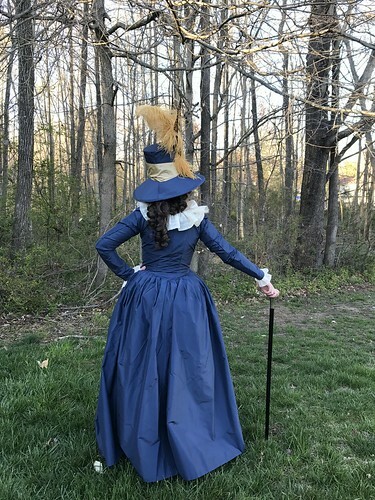 I present the 1780s Roundgown and Hat O'Doom! 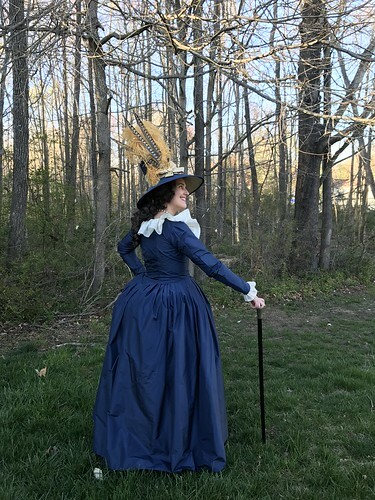 I love this dress and it was the perfect project to get me back into historical costuming. 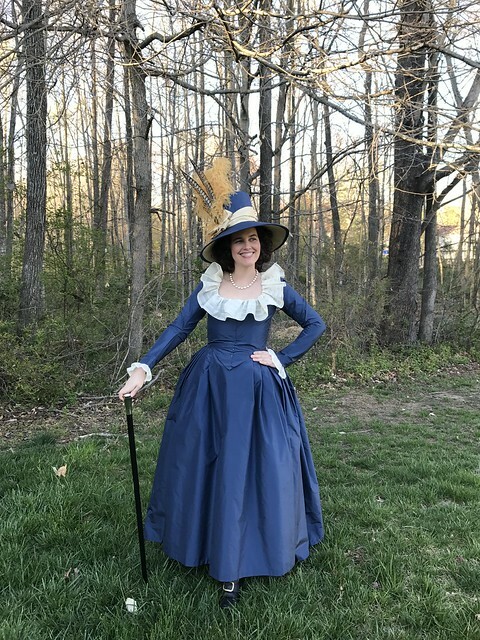 The fabric is a blue silk taffeta I bought on a trip to New York in September 2016 and an off-white light weight fabric of unknown origin for the ruffles. I used my trusty old 18th century pattern block for the pattern and used the same techniques I used for the Red Silk Roundgown. Overall, I'm pretty happy with it. This is the first time I put it on my dress form. 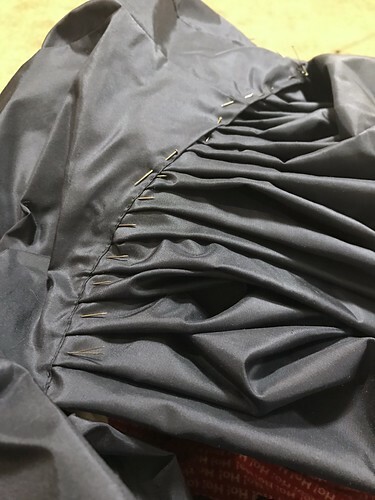 And sewing the skirt to the bodice. I'm getting a pretty gnarly wrinkle at the waist but I'm hoping that is just a result of my entirely awful stays. The part that really tipped the outfit into fabulous territory is my coordinating hat! 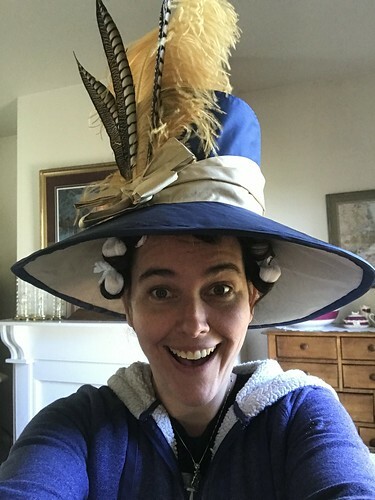 This is my first official hat that I have made - I covered a Timely Tresses bonnet back in the day and I've trimmed hats but this one is the first one I've built from buckram. I'm super proud of it and I will post a more complete write up about its construction when I take a few more pictures. It's definitely a first hat but I learned a lot that wasn't in online tutorials that I could find so I'm going to share. Everything came together and created the exact picture I had in my head. Now that I have a bigger sewing room and easy access to my fabric and supplies, as well as a little more time to spare, I'm hoping to have more to share soon. See my full Flickr album here. Guh! The colour and shape and hat are just DIVINE. I love this! 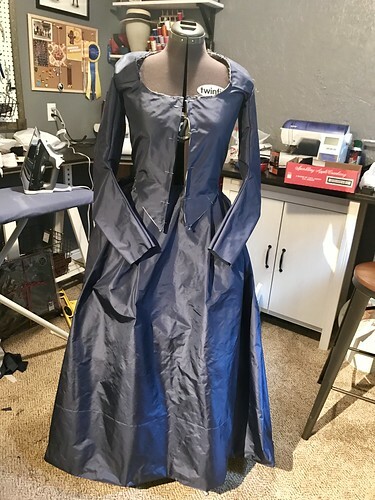 And how timely for you to post this - I was just looking at some fabric and wondering what to make with it and a round gown is the perfect thing! Welcome back! That hat is totally fab! !